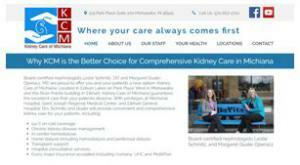 Dr. Leslie Schmitz, DO said, “Our new website is designed to help our patients stay up-to-date with advances in kidney care methods and technologies while explaining the role our group plays in assisting them understand their care options and effectively manage their treatment protocols.” See https://www.kidneycareofmichiana.com/about. With privileges at Memorial Hospital, Saint Joseph Regional Medical Center, and Elkhart General Hospital, Board-certified nephrologists Leslie Schmitz, DO and Margaret Quate-Operacz, MD provide convenient and comprehensive kidney care including 24/7 on-call coverage, chronic kidney disease management, in-center hemodialysis, home dialysis including hemodialysis and peritoneal dialysis, transplant support, and hospital consultative services. Additionally, Kidney Care of Michiana accepts every major insurance carrier including Humana, UHC and MultiPlan. For details visit our website at www.KidneyCareofMichiana.com.